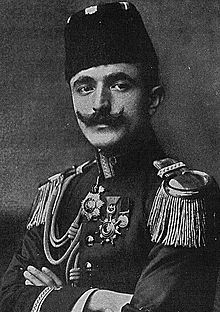 İsmail Enver (Ottoman Turkish: اسماعيل انور) (November 22, 1881 in Istanbul - August 4, 1922), he was known to European powers as Enver Pasha (Turkish: Enver Paşa) or Enver Bey and he was a Turkish military officer and a leader of the Young Turk revolution. His contributions for the revolution, he was given the nickname "The Hero of Liberty"(Hürriyet Kahramanı). He was the main leader of the Ottoman Empire in both Balkan Wars and World War I.
Enver Bey (center) talking to the British attaché and press in Istanbul immediately after seizing power in the 1913 Raid on the Sublime Porte, also known as the 1913 Ottoman coup d'état. Enver Pasha and Wilhelm Souchon inspecting the troops. 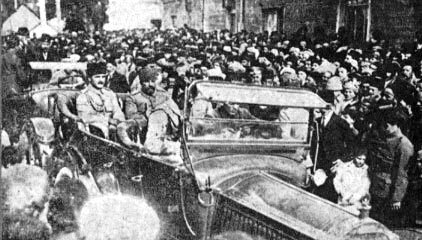 Enver Pasha as the War Minister of the Ottoman Empire during the First World War. Wilhelm II and Enver Pasha in Gallipoli. 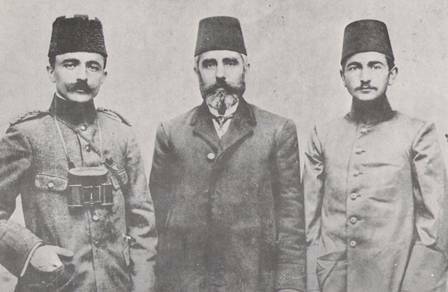 Enver Pasha, middle, accompanied by Djemal Pasha (right), in a visit to the Dome of the Rock in Jerusalem, following the end of the Gallipoli campaign. Enver Pasha’s grave at the Abide-i Hürriyet (Monument of Liberty) cemetery in Istanbul, where his remains were interred in 1996. Enver Pasha Facts for Kids. Kiddle Encyclopedia.